INDEPENDENCE, MO – As the Kansas City Mavericks embark on another weekend set of games, they continue to find new ways to grind out victories. We could continue to discuss the incredible pile of injuries the team has endured this season. We could look at players being called up to the American Hockey League or moving on to play in Europe at inopportune times. But, let’s instead look at the “new” Mavericks squad we saw grow up in a three-game set last weekend vs. division leading Toledo. The “new” Mavericks include three players signed last week from the SPHL that were immediately thrown into the fray of intense inter-divisional games. 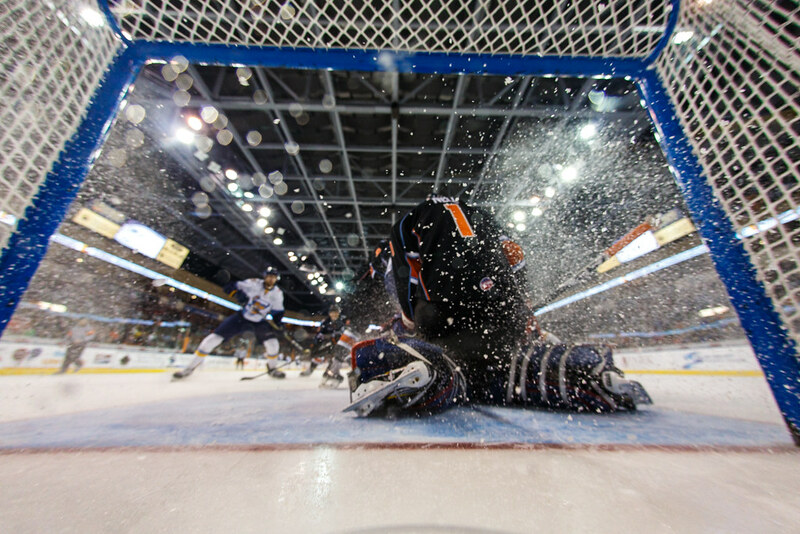 The “new” Mavericks include goalie Chris Nell, assigned to the team recently courtesy of the New York Rangers. The “new” Mavericks scrap, claw, grit, grind, gut, forecheck, backcheck, and paycheck their way to win two out of those three games last weekend. What looked like your third line to start the year is now your first line. Tyler Parsons has been injured, rehabbed, called up to Stockton and then returned to the Mavericks on Thursday. Mason McDonald has been up to Stockton, back down, and now back up again. Yet, as we’ve talked over the last month, this team continues to find a way to put wins together. John-Scott Dickson is a massive part of that and to undersell the coaching job that he has done this year is a travesty. Dickson should be considered a serious contender for Coach of the Year honors in the ECHL. Don’t believe that? Find me another team that has gone through what the Mavericks have this season and still be in contention for a playoff spot. The style of play that Dickson has instilled on this team is a shell of what he thought it would be this season, but it’s still effective against the top competition this league has to offer. He’s had to play a much more straight-forward brand of hockey than was initially intended, but my goodness has it been effective. The keyword the Mavericks have honed in on is grit. Simple word. One syllable. Makes you think of sandpaper. But, it embodies this team right now. The Mavericks out-grit you night in and night out. Example: The Mavericks flat wore out the Walleye last Sunday. Once the Mavericks took a 2-1 lead, that game was over. The Walleye had no legs left and as my good friend, Brandon Weiss (Mavericks media relations director), likes to remind me; legs feed the wolf. The Mavericks are out-gritting the competition to the corners; they are sacrificing the body in front of shots, they are winning board battles they weren’t winning earlier this year when they, on paper, had more “talent” on the ice. In reality, they’re playing the exact same way their leader — #40 –play on that same ice just a few short years ago. When it’s played correctly, it is a thing of ugliness. But, in ugliness, there is great beauty. I’m a fourth line guy through and through. I love the grinders that are just barely hanging on in the league because they offer a certain aspect of the game that gives them value. Those are my guys. They’re not afraid to put their body in a position it probably has no business being placed in. They do the little things no one else wants to do. They’re missing teeth and have probably had years taken off their life, but they don’t even care. They’re the everyman. This Mavericks squad…this “new” Mavericks squad, is comprised of guys with a fourth line mentality. Do whatever it takes to help the team and to win and quit worrying about where you’re going to play next week because you’re focused on getting the win this week. As the Mavericks gear up for a two-game weekend set with Rapid City, they have to continue to embrace this philosophy and style of play to be successful. The playoffs will be here before you know it and with any luck, the “new” Mavericks will be a part of the festivities.